Depending on the problem you will need to shift between multiple external systems (S3, HDFS, Kafka, etc) to validate and debug. We are consuming external resources for development purposes which increasing cost. You may be using a copy of production data or worse production data itself. Someone making a mistake may lead to the production data getting corrupted. There is possibility that the production copy may not cover all your use cases. Depending on your data you may have to run the jobs for a long time on huge compute resources. In conclusion the big data developer is wasting his time. Also increasing cost by using external system resources. This blog post is intended for big data developers facing such issues. I will take you through a simple approach for big data solutions to speed-up the process of testing and debugging spark jobs. It is assumed that you are familiar with Spark. Practically other than unit testing we may also need to do integration tests and load tests. Such cases like connectivity with external systems, scalability under load, etc. is not unit testing and are beyond the scope of this blog. Following code should approximate the spark job that gets usually written. To connect with file storage systems like S3/HDFS. Proper test data in S3 to cover all use-cases. Some place to run this job. In unit testing we test units of programs like methods, utilities, services, etc. Any external systems are mocked with a similar implementation. For e.g. in the above snippet we can refactor the code to support reading from S3 in production and reading from local file for unit test purposes. Note that and code related to Kafka initialisation was skipped. In writing unit test we don't need to deal with external systems anyway. We only need to concern ourselves with logic testing of the job. Later we will mock it. We will, to make the code testable, refactor the code as follows. For us now the doSomeThing method is the unit to test. The returned dataframe can be used for assertions in unit tests or writing to external systems like Kafka on production. We will now define a few environments, for convinence sake. Next we will define a FileService trait. A ServiceFactory will return different implementations of this trait depending on the environment. I have defined the FileServiceDummy for explanation in this bog. 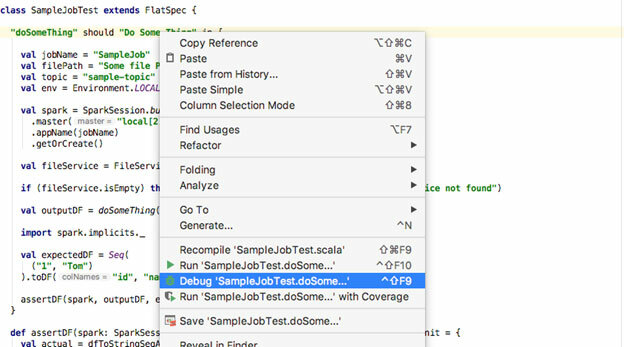 Ideally you will use the FileServiceCSV with yours test data residing in your local machine in CSV format. As you can see we have mocked the file reading code which can be selected based on the run time. By default it will try to read the parquet file since we have defined the environment as production. libraryDependencies += "org.scalatest" % "scalatest_2.11" % "3.0.5"
to the project's .sbt file. Following is the unit test for our doSomeThing method. The test class extends the FlatSpec class. This class provides is a BDD style unit test functionality. Since, we have selected the environment as LOCAL the factory will then return the FileServiceDummy implementation. You can switch to DEV to fetch it from a local CSV file. The assertDF utility will test the actual and expected dataframes. To run this I use IntelliJ since it's convenient to debug. Right clicking on the test to run, should give you the necessary options. No connectivity with external systems required. It's easy to validate and debug since the input output is confined within our own machine. The data can be customised for testing and we can cover more use-cases because of it. It's easy to switch between different environments. We save cost by using our own machine only.